Frugal retirement is about having fun, spending less money does not mean sacrifice...do we look deprived? Let me tell you a brief story about ourselves and how we embarked on our spending less retirement living lifestyle. 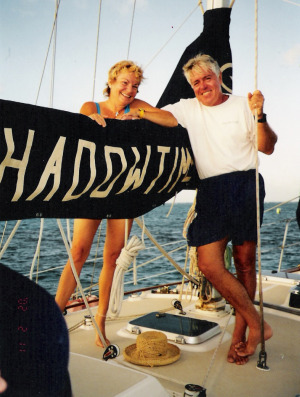 In 1990, while visiting the Virgin Islands on a cruise ship, we spent four hours on a sailboat in St. Thomas,USVI. We had never set foot on a sailboat before... As the cruise ship left the harbor that evening I looked at the several dozen sailboats in the harbor, among which was the boat we had been on earlier that day, with their owners sitting in the cockpit with cocktails toasting the leaving cruise ships. I wanted to do the same... We did it and we can show you how as well. We decided right there, to retire in five years... We actually retired in 1994 and are still retired to this day. 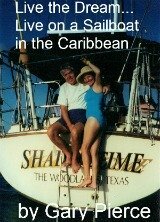 We have stayed retired by enjoying frugal retirement lifestyles that you may have never considered. Living on a sailboat may or may not appeal to you... It was fun and cheap too...This led to several other lifestyles that we enjoyed just as much as a sailboat. Let us show you how. We were enjoying the country club lifestyle, I was a commercial real estate broker, my wife worked for the development company in the community that we lived. We were told there is no way we could make such a radical lifestyle change... We felt that the worst that could happen to us would be that we would have to return to work...it never came to returning to work. To this day, some of the same naysayers are still working, and we have been doing what we please since 1994. Moving from a large home to a small sailboat teaches you the lesson that you do not need a lot of the material things that a "normal" lifestyle entails... New cars, tailored suits, expensive vacations were replaced by swimsuits, T-shirts and coverups, sandals, sunglasses and floppy hats. We did not miss our"stuff"...one little bit. Living on a boat, as I said before, is not for everyone... But this lifestyle led to others that we enjoyed on land... You can do this too. These lifestyles you can enjoy from land included, living overseas, certainly cheaper than living in the US. We also enjoyed the RV lifestyle...which is another way to downsize. Finally we discovered the park model living lifestyle. The main point being that we enjoyed retirement so much, rather than working, that we found ways to stretch our dollars and stay retired. If you think that frugal retirement is preferred to the working lifestyle, we can show you how to do it...safely and did I mention that it is a lot of fun as well? The longest journey begins with one step, before giving up on retirement, or saying that you cannot afford to retire, let us show you these ways of spending less. If we can do it we know you can do it too.